Rap It Up at the creek crossing. This is about a 4' slope down the bank to the water. Just thought I’d send you a quick update on Rap. He had a great weekend. I was able to ride him all 3 days, between rain storms. My wife and I set out an a trail ride Friday evening, a little later than we had intended, we took our usual route out across the hay fields and down to our trails in the woods. We rode across creek crossings and up and down several hills and Ol’ Rap did great. It got dark pretty quick so we decided to head back to the barn. As we were making our way back we met one of the guys who deer hunts the area who was riding his ATV with headlights on and Rap acted as if he saw stuff like that everyday. After chatting with the deer hunter briefly, we headed on back to the barn, by this time, it was very dark in the woods and Rap led the way as if he had been on those trails all his life rather than just for the last month. When we got back from our ride, I clipped his bridle path and the whiskers on his muzzle, he stood in the middle of the barn hallway with his head down completely unrestrained while this was going on. We (me, my wife and my brother ) rode Saturday afternoon and had a very good ride. 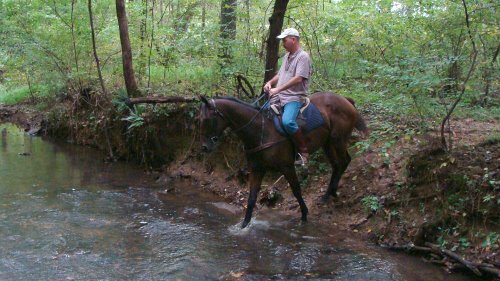 We have a trail where you have to wade the creek for about 100 yards after stepping off an 18″ bank and Rap did very well. As a matter of fact, he did better than the horse in front of him being ridden by my brother who had been down that trail several times before. He is dead quiet on the trails and seems unruffled by most anything. He has been exposed to cattle and whitetail deer, rabbits, squirrels and Randy the Border Collie, and don’t forget the ATV at night! and has taken it all in stride. I have been riding him in a D ring snaffle and no martingale, and so far he has been doing great. Oh, and I have to wear spurs just to keep him from “poking” along. Putting ground poles in place "No big deal!" Click on this image to see more photo albums. Sunday was a big day for Rap. My wife and I rode the trails for a while and then decided to do some ring work. 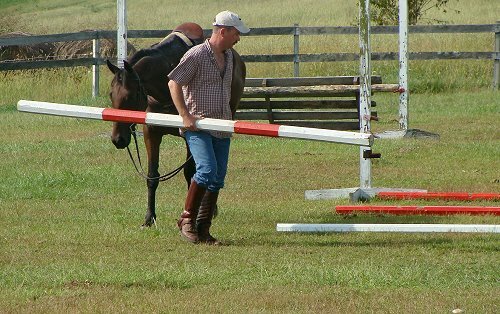 I laid down some ground poles and walked him through them a couple times and then trotted him through them several times. He did great and is already learning how to lengthen or shorten his stride as needed. He did so well and was so relaxed that I decided to try jumping him over a low cross rail. Like everything else I have asked him to do, he did great. He has a “no big deal” attitude about most everything I ask him to do. It has been a great weekend for Rap and for me. This has been one of those times when as a rider, you reflect on everything that was accomplished by your horse and are very proud of the progress that he has made. It is that great “satisfied” feeling that keeps all of us doing what we do, Ride! Ride! Ride! Rap is great and I think will do nothing but get better! I am attaching a few pieces of evidence to “back up my claims”. I hope you and Barry had as good a weekend as we did!